IP sockets are the lowest level layer upon which high level internet protocols are built--every thing from HTTP, to SSL, to POP3, to Kerberos, to UDP-Time. To implement custom protocols, or to customize implementation of well-known protocols, a programmer needs a working knowledge of the basic socket infrastructure. A similar API is available in many languages; this tutorial focuses primarily on C programming, but it also uses Python as a representative higher-level language for examples. Readers of this tutorial will be introduced to the basics of programming custom network tools using the cross-platform Berkeley Sockets Interface. Almost all network tools in Linux and other Unix-based operating systems rely on this interface. This tutorial requires a minimal level of knowledge of C, and ideally of Python also (mostly for part two). However, readers who are not familiar with either programming language should be able to make it through with a bit of extra effort; most of the underlying concepts will apply equally to other programming languages, and calls will be quite similar in most high-level scripting languages like Ruby, Perl, TCL, etc. While this tutorial introduces the basic concepts behind IP (internet protocol) networks, it certainly does not hurt readers to have some prior acquaintance with the concept of network protocols and layers. David Mertz is a writer, a programmer, and a teacher, who always endeavors to improve his communication to readers (and tutorial takers). He welcomes any comments, please direct them to <mertz@gnosis.cx> . 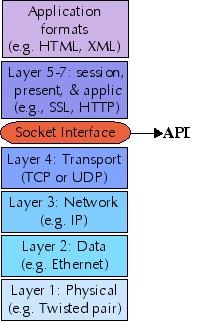 What we usually call a computer network is composed of a number of "network layers" , each providing a different restriction and/or guarantee about the data at that layer. The protocols at each network layer generally have their own packet formats, headers, and layout. The seven traditional layers of a network are divided into two groups: upper layers and lower layers. The sockets interface provides a uniform API to the lower layers of a network, and allows you to implement upper layers within your sockets application. Further, application data formats may themselves constitute further layers, e.g. SOAP is built on top of XML, and ebXML may itself utilize SOAP. In any case, anything past layer 4 is outside the scope of this tutorial. While the sockets interface theoretically allows access to protocol families other than IP, in practice, every network layer you use in your sockets application will use IP. For this tutorial we only look at IPv4; in the future IPv6 will become important also, but the principles are the same. At the transport layer, sockets support two specific protocols: TCP (transmission control protocol) and UDP (user datagram protocol). Sockets cannot be used to access lower (or higher) network layers; for example, a socket application does not know whether it is running over ethernet, token ring, or a dialup connection. Nor does the sockets pseudo-layer know anything about higher-level protocols like NFS, HTTP, FTP, and the like (except in the sense that you might yourself write a sockets application that implements those higher-level protocols). At times, the sockets interface is not your best choice for a network programming API. Specifically, many excellent libraries exist (in various languages) to use higher-level protocols directly, without having to worry about the details of sockets--the libraries handle those details for you. While there is nothing wrong with writing your own SSH client, for example, there is not need to do so simply to let an application transfer data securely. Lower-level layers than those sockets address fall pretty much in the domain of device driver programming. As the last panel indicated, when you program a sockets application, you have a choice to make between using TCP and using UDP. Each has its own benefits and disadvantages. TCP is a stream protocol, while UDP is a datagram protocol. That is to say, TCP establishes a continuous open connection between a client and a server, over which bytes may be written--and correct order guaranteed--for the life of the connection. However, bytes written over TCP have no built-in structure, so higher-level protocols are required to delimit any data records and fields within the transmitted bytestream. UDP, on the other hand, does not require that any connection be established between client and server, it simply transmits a message between addresses. A nice feature of UDP is that its packets are self-delimiting--each datagram indicates exactly where it begins and ends. A possible disadvantage of UDP, however, is that it provides no guarantee that packets will arrive in-order, or even at all. Higher-level protocols built on top of UDP may, of course, provide handshaking and acknowledgements. A useful analogy for understanding the difference between TCP and UDP is the difference between a telephone call and posted letters. The telephone call is not active until the caller "rings" the receiver and the receiver picks up. The telephone channel remains alive as long as the parties stay on the call--but they are free to say as much or as little as they wish to during the call. All remarks from either party occur in temporal order. On the other hand, when you send a letter, the post office starts delivery without any assurance the recipient exists, nor any strong guarantee about how long delivery will take. The recipient may receive various letters in a different order than they were sent, and the sender may receive mail interspersed in time with those she sends. Unlike with the USPS, undeliverable mail always goes to the dead letter office, and is not returned to sender. Beyond the protocol--TCP or UDP--there are two things a peer (a client or server) needs to know about the machine it communicates with: An IP address and a port. An IP address is a 32-bit data value, usually represented for humans in "dotted quad" notation, e.g., 64.41.64.172 . A port is a 16-bit data value, usually simply represented as a number less than 65536--most often one in the tens or hundreds range. An IP address gets a packet to a machine, a port lets the machine decide which process/service (if any) to direct it to. That is a slight simplification, but the idea is correct. The above description is almost right, but it misses something. Most of the time when humans think about an internet host (peer), we do not remember a number like 64.41.64.172 , but instead a name like gnosis.cx . To find the IP address associated with a particular host name, usually you use a Domain Name Server, but sometimes local lookups are used first (often via the contents of /etc/hosts ). For this tutorial, we will generally just assume an IP address is available, but the next panel discusses coding name/address lookups. The command-line utility nslookup can be used to find a host IP address from a symbolic name. Actually, a number of common utilities, such as ping or network configuration tools, do the same thing in passing. But it is simple to do the same thing programmatically. In C, that standard library call gethostbyname() is used for name lookup. The below is a simple implementation of nslookup as a command-line tool; adapting it for use in a larger application is straightforward. Of course, C is a bit more finicky than Python is. Notice that the returned value from gethostbyname() is a hostent structure that describes the names host. The member host->h_addr_list contains a list of addresses, each of which is a 32-bit value in "network byte order"--i.e. the endianness may or may not be machine native order. In order to convert to dotted-quad form, use the function inet_ntoa() . My examples for both clients and servers will use one of the simplest possible applications: one that sends data and receives the exact same thing back. In fact, many machines run an "echo server" for debugging purposes; this is convenient for our initial client, since it can be used before we get to the server portion (assuming you have a machine with echod running). I would like to acknowledge the book TCP/IP Sockets in C by Donahoo and Calvert (see Resources). I have adapted several examples that they present. I recommend the book--but admittedly, echo servers/clients will come early in most presentations of sockets programming. The steps involved in writing a client application differ slightly between TCP and UDP clients. In both cases, you first create the socket; in the TCP case only, you next establish a connection to the server; next you send some data to the server; then receive data back; perhaps the sending and receiving alternates for a while; finally, in the TCP case, you close the connection. There is not too much to the setup. A particular buffer size is defined, which limits the amount of data echo'd at each pass (but we loop through multiple passes, if needed). . A small error function is also defined. The arguments to the socket() call decide the type of socket: PF_INET just means it uses IP (which you always will); SOCK_STREAM and IPPROTO_TCP go together for a TCP socket. The value returned is a socket handle, which is similar to a file handle; specifically, if the socket creation fails, it will return -1 rather than a positive numbered handle. Now that we have created a socket handle, we need to establish a connection with the server. A connection requires a sockaddr structure that describes the server. Specifically, we need to specify the server and port to connect to using echoserver.sin_addr.s_addr and echoserver.sin_port . The fact we are using an IP address is specified with echoserver.sin_family , but this will always be set to AF_INET . As with creating the socket, the attempt to establish a connection will return -1 if the attempt fails. Otherwise, the socket is now ready to accept sending and receiving data. Now that the connection is established, we are ready to send and receive data. A call to send() takes as arguments the socket handle itself, the string to send, the length of the sent string, and a flag argument. Normally the flag is the default value 0. The return value of the send() call is the number of bytes successfully sent. The rcv() call is not guaranteed to get everything in-transit on a particular call--it simply blocks until it gets something . Therefore, we loop until we have gotten back as many bytes as were sent, writing each partial string as we get it. Obviously, a different protocol might decide when to terminate receiving bytes in a different manner (perhaps a delimiter within the bytestream). Calls to both send() and recv() block by default, but it is possible to change socket options to allow non-blocking sockets. However, this tutorial will not cover details of creating non-blocking sockets, nor such other details used in production servers as forking, threading, or general asynchronous processing (built on non-blocking sockets). A socket server is a bit more complicated than is a client, mostly because a server usually needs to be able to handle multiple client requests. Basically, there are two aspects to a server: handling each established connection, and listening for connections to establish. In our example, and in most cases, you can split the handling of a particular connection into support function--which looks quite a bit like a TCP client application does. We name that function HandleClient() . Listening for new connections is a bit different from client code. The trick is that the socket you initially create and bind to an address and port is not the actually connected socket. This initial socket acts more like a socket factory, producing new connected sockets as needed. This arrangement has an advantage in enabling fork'd, threaded, or asynchronously dispatched handlers (using select() ); however, for this first tutorial we will only handle pending connected sockets in synchronous order. The BUFFSIZE constant limits the data sent per loop. The MAXPENDING constant limits the number of connections that will be queued at a time (only one will be serviced at a time in our simple server). The Die() function is the same as in our client. The handler for echo connections is straightforward. All it does is receive any initial bytes available, then cycle through sending back data and receiving more data. For short echo strings (particularly if less than BUFFSIZE ) and typical connections, only one pass through the while loop will occur. But the underlying sockets interface (and TCP/IP) does not make any guarantees about how the bytestream will be split between calls to recv() . The socket that is passed in to the handler function is one that already connected to the requesting client. Once we are done with echoing all the data, we should close this socket; the parent server socket stays around to spawn new children, like the one just closed. As we outlined before, creating a socket has a bit different purpose for a server than for a client. Creating the socket has the same syntax it did in the client; but the structure echoserver is setup with information about the server itself, rather than about the peer it wants to connect to. You usually want to use the special constant INADDR_ANY to enable receiving client request on any IP address the server supplies; in principle, such as in a multi-hosting server, you could specify a particular IP address instead. Notice that both IP address and port are converted to network byte order for the sockaddr_in structure. The reverse functions to return to native byte order are ntohs() and ntohl() . These functions are no-ops on some platforms, but it is still wise to use them for cross-platform compatibility. Once the server socket is bound, it is ready to listen() . As with most socket functions, both bind() and listen() return -1 if they have a problem. Once a server socket is listening, it is ready to accept() client connections, acting as a factory for sockets on each connection. Creating new sockets for client connections is the crux of a server. The function accept() does two important things: it returns a socket pointer for the new socket; and it populates the sockaddr_in structure pointed to, in our case, by echoclient . We can see the populated structure in echoclient with the fprintf() call that accesses the client IP address. The client socket pointer is passed to HandleClient() , which we saw at the start of this section. Python's standard module socket provides almost exactly the same range of capabilities you would find in C sockets. However, the interface is generally more flexible, largely because of the benefits of dynamic typing. Moreover, an object-oriented style is also used. For example, once you create a socket object, methods like .bind() , .connect() , and .send() are methods of that object, rather than global functions operating on a socket pointer. At a higher level than socket , the module SocketServer provides a framework for writing servers. This is still relatively low level, and higher-level interfaces are available for server of higher-level protocols, e.g. SimpleHTTPServer , DocXMLRPCServer , or CGIHTTPServer . At first brush, we seem to have left out some of the error catching code from the C version. But since Python raises descriptive errors for every situation that we checked for in the C echo client, we can let the built-in exceptions do our work for us. Of course, if we wanted the precise wording of errors that we had before, we would have to add a few try / except clauses around the calls to methods of the socket object. We also have a choice between the methods .send() and .sendall() . The former sends as many bytes as it can at once, the latter sends the whole message (or raises an exception if it cannot). For this client, we indicate if the whole message was not sent, but proceed with getting back as much as actually was sent. The only thing we need to provide is a child of SocketServer.BaseRequestHandler that has a .handle() method. The self instance has some useful attributes, such as .client_address , and .request which is itself a connected socket object. In truth, this "hard way" still isn't very hard. But as in the C implementation, we manufacture new connected sockets using .listen() , and call our handler for each such connection. The server and client presented in this tutorial are simple, but they show everything essential to writing TCP sockets applications. If the data transmitted is more complicated, or the interaction between peers (client and server) is ore sophisticated in your application, that is just a matter of additional application programming. The data exchanged will still follow the same pattern of connect() and bind() , then send() 's and recv() 's. One thing this tutorial did not get to, except in brief summary at the start, is usage of UDP sockets. TCP is more common, but it is important to also understand UDP sockets as an option for your application. Part two of this tutorial will look at UDP, as well as implementing sockets applications in Python, and some other intermediate topics. A good introduction to sockets programming in C, is Michael J. Donahoo and Kenneth L. Calvert, TCP/IP Sockets in C , Morgan-Kaufmann, 2001; ISBN: 1-55860-826-5. Please let us know whether this tutorial was helpful to you and how we could make it better. We'd also like to hear about other tutorial topics you'd like to see covered. For questions about the content of this tutorial, contact the author, David Mertz, at mertz@gnosis.cx .